Product #21288 | SKU 33S963 | 0.0 (no ratings yet) Thanks for your rating! 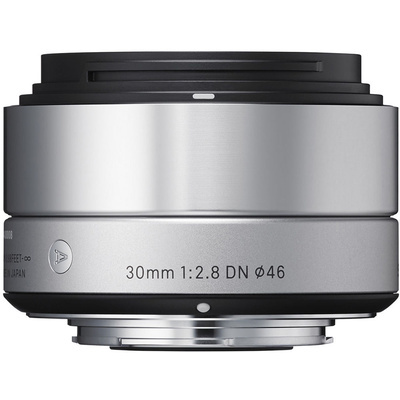 The silver 30mm f/2.8 DN Lens for Micro Four Thirds Cameras from Sigma is standard length prime lens for Micro Four Thirds cameras. Its focal length is equivalent to a 60mm lens in the 35mm format and its minimum focus distance is 30 cm. Its f/2.8 maximum aperture is ideal for shallow depth of field imaging and allows it to maintain sharpness in low light situations. An inner focusing system means the lens does not extend when focusing and its newly developed linear autofocus motor is accurate and quiet. Sigma's Super Multi-Layer Coating reduces flare and ghosting and provides sharp and high contrast images even at the maximum aperture, and with two glass moulded aspherical elements including a double-sided aspherical element, aberrations are kept to a minimum. The result is accurate colour definition and sharp imaging across the frame. A metal exterior provides durability and handsome design. Maximum aperture of f/2.8 is effective in low light situations and able to create lovely shallow depth of field images. Inner focusing system and linear autofocus motor for efficient, smooth, quiet and accurate focus. Two glass moulded aspherical elements, including a double-sided aspherical element and Super Multi-Layer Coating minimises aberrations and reduces flare and ghosting for sharp, high contrast images. A brass bayonet mount has both high accuracy and durability. A special treatment to reinforce its strength is applied to the surface giving it greater strength and making it highly resistant to long-term use.